Bergen Toy & Novelty Co. Sales list. All photos show the actual items for sale, and most are priced as groups by similar or complementary colors. 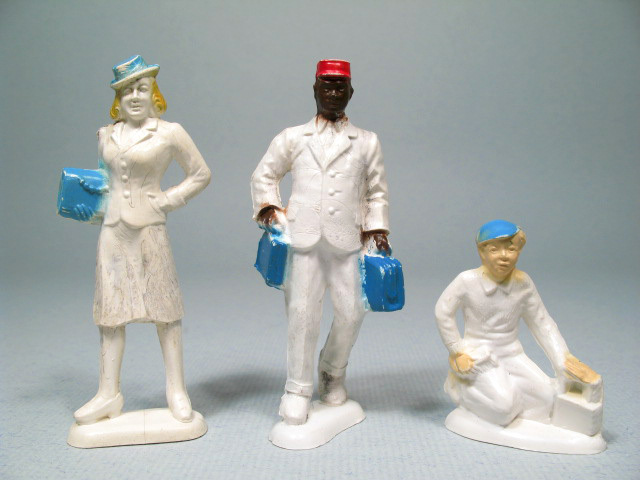 Where individual figures are for sale, this is clearly indicated. 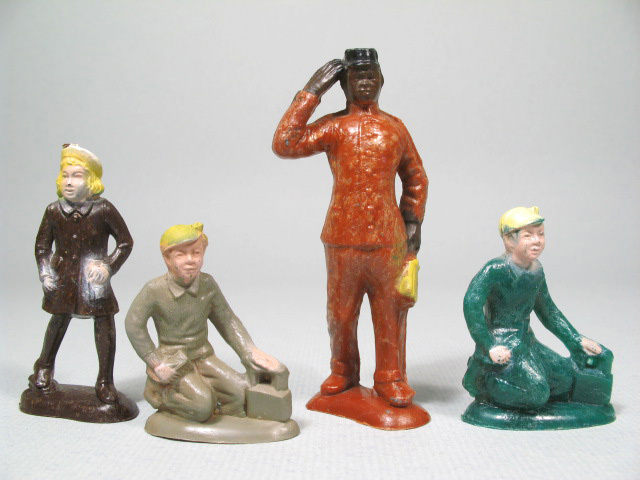 ID numbers are taken from Richard O'Brien's Collecting American-Made Toy Soldiers, Edition No. 3, 1997. 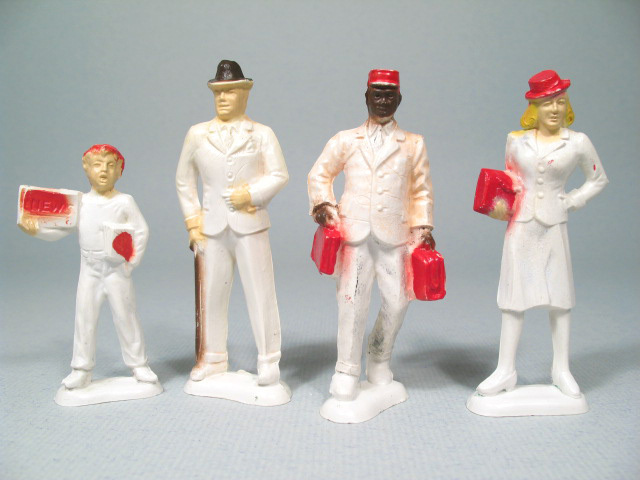 Both paint condition and color variations vary widely in Beton toys, and every attempt has been made to provide accurate color photos (and verbal descriptions, where needed). Mild paint loss and imperfections are common, but there are no breaks, splits, cracks, chips, repairs, significant paint wear, or deterioration of the plastic unless noted. All items are in hard plastic unless stated otherwise. 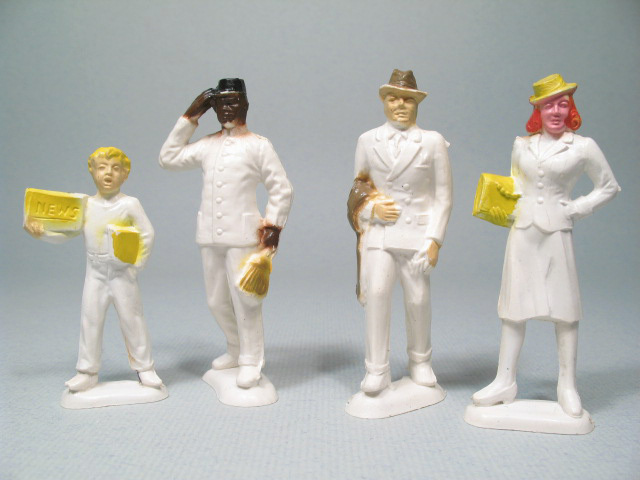 If you would like to see another view of any figure or group, Ponylope can e-mail photos on request — just ask! Free shipping on all orders of $75 or more. Unless stated otherwise: All oval bases have the raised logo BETON / CARLSTADT N.J. / U.S.A. underneath. 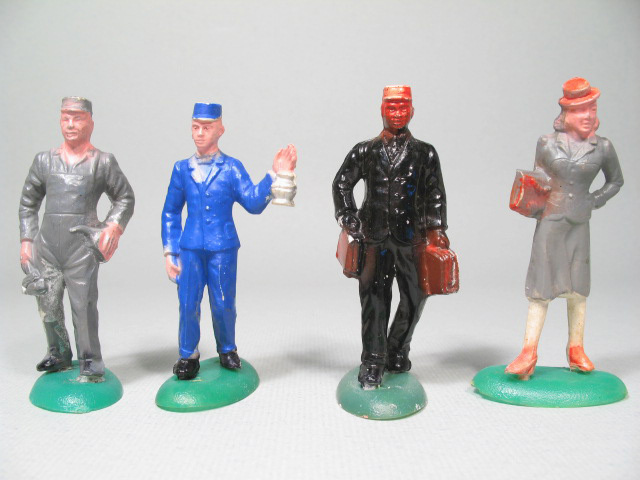 railroad figures with cast bases on this page have partial logos. All have BETON / CARLSTADT N.J. / U.S.A. logo under base. Bases not perfectly flat. small amount of paint loss on face. 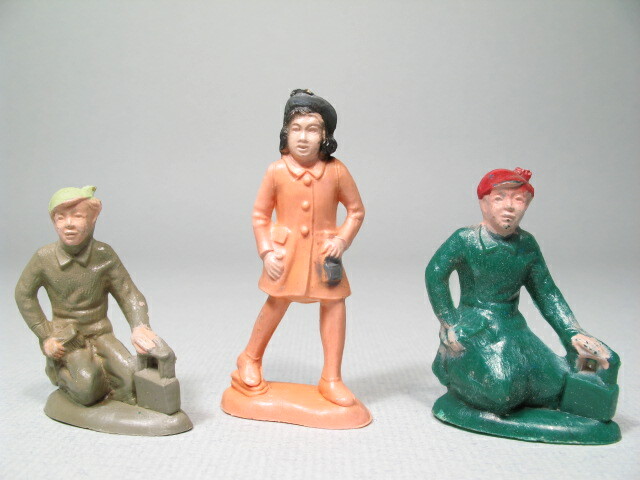 Four different colors of plastic were used to mold this group: dark brown, taupe, red-brown, and dark green. Nice condition. Girl is an unusual base color. neat, bright overpainting. One-part logo under base, except Salesman has no logo. dark marks on legs in front. One-part logo under base. BT 42 has striations in skirt that look molded in; paint loss on hat. Beautiful face paint on Red Cap. 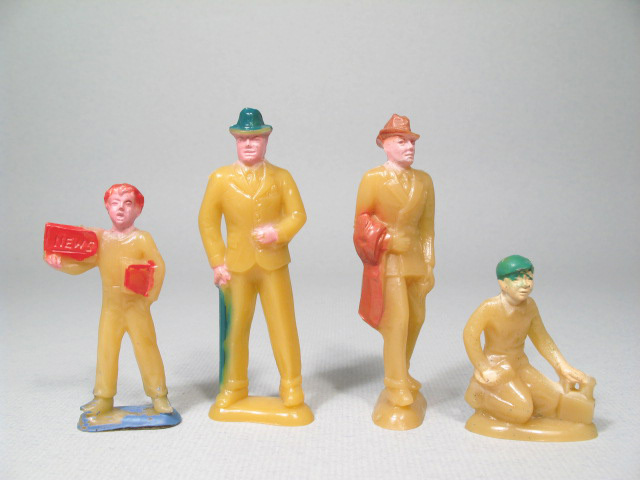 Vintage Toy Horses and Plastic Playset Miscellany from the 1950s On . . .